Indian Institute of Technology Bhubaneswar! IIT Bhubaneswar will celebrate its 11th Foundation Day on 12th February 2019 (Tuesday). To commemorate this special occasion, IIT Bhubaneswar has planned to host an "Open Day & Exhibition"in our campus at Argul from 09:30 am to 6 pm. 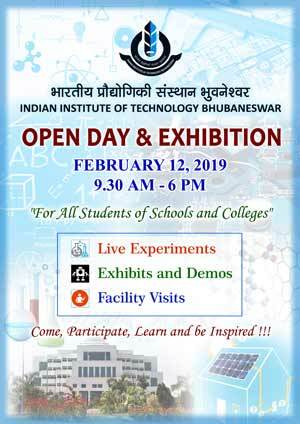 The “Open Day & Exhibition” will showcase science and technology initiatives undertaken in various areas such as Energy, Materials, Healthcare, Engineering, Physics, Chemistry and Biosciences at IIT Bhubaneswar through simple, easy to understand live experiments and exhibits (there will be more than 205 live experiments) to inspire as well as to promote scientific talent among students, across all schools and colleges of Science and Engineering.